A lounging blue Tyrannosaur stares out of a hazy electric green jungle across a lazy stream on a warm afternoon in late summer. An electric blue Parksosaurus warreni “dances” among a wide variety of flowering plants known from different locations across Alaska and Russia during the Cretaceous era. While we are most familiar with the Pleistocene-era Bering land bridge connecting North America and Eurasia, evidence of many shared fossil plant and animal species show Alaska also bridged the continents during the late Cretaceous. Fossil footprints found in Denali National Park revealed that at least two species of pterosaur (ancient flying reptiles that were "cousins" to dinosaurs) roamed the north lands and flew the chilly skies of Cretaceous Alaska around 70 million years ago. A scene of the estuaries of Pleistocene era California depicting a scavenging short-faced bear, Arctodus simus, feeding off a spawned-out female Oncorhynchus rastrosus, the "saber-toothed" salmon, with an entourage of ancestral California gulls, Larus californicus. In the water, a pair of speculative ocean-phase Oncorhynchus enters the estuary looking for food, while a pair of spawning males jockey for status and position, ready to meet their fate upstream. 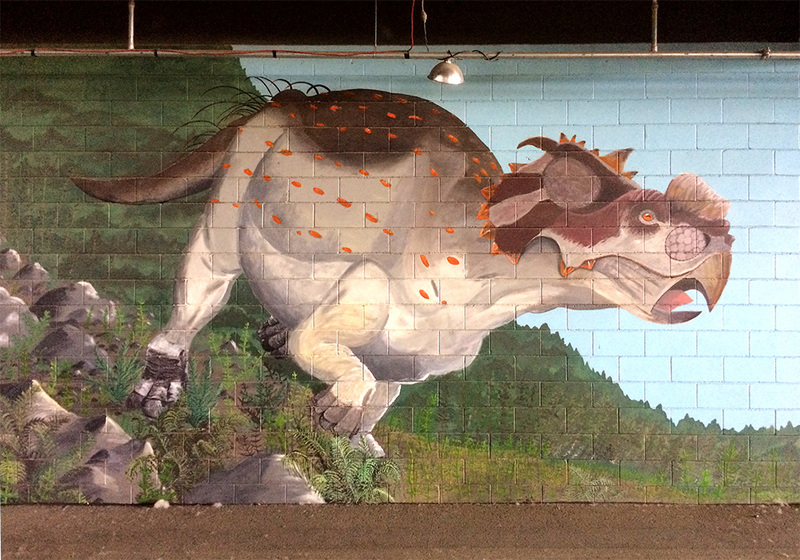 It's been ten years since we started work on the Pachyrhinosaurus mural at the 2007 Alaska State Fair, representing two months of weekends—a project which originated with Carmen Summerfield's Valley Arts Alliance. Scott designed the overall mural, and Raven conscripted co-workers and friends to help paint the 330 ft. square area offered by the Palmer Fairgrounds management. 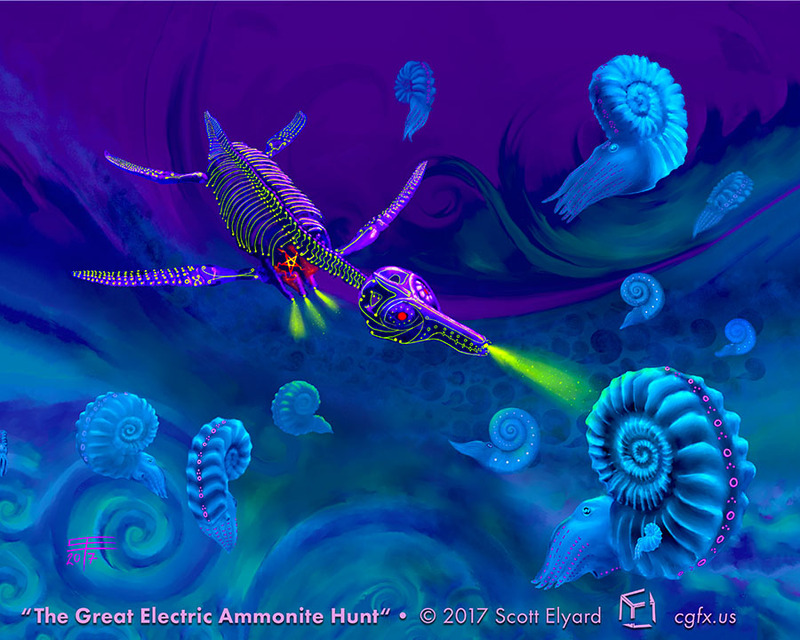 One of the newest paintings made specifically for our Odds and Ends Art Show, this scene features Dolichorhynchops and vast numbers of ammonites in an ethereal struggle for survival. In all such cases, lights are involved. This is the fifth painting in the eletrotiki series.